Start here! 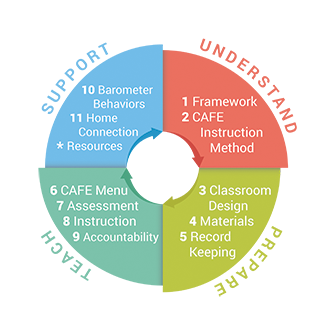 Learn every aspect of what makes up the prep, implementation, and support of CAFE. Easily find articles, videos, and lessons for each CAFE strategy. Learn more about the research behind CAFE, and why it was developed. Though CAFE is a flexible system, there are elements that are essential to its integrity and success. 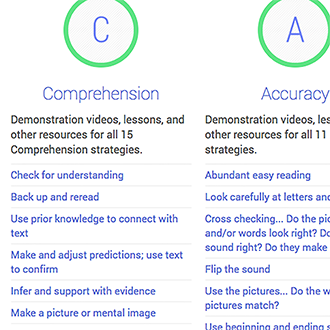 These Elements fit into four stages: Understand, Prepare, Teach, and Support. This document are not intended to be used for evaluative purposes, but as a tool to help you assess your knowledge and application of each element and its supporting behaviors. 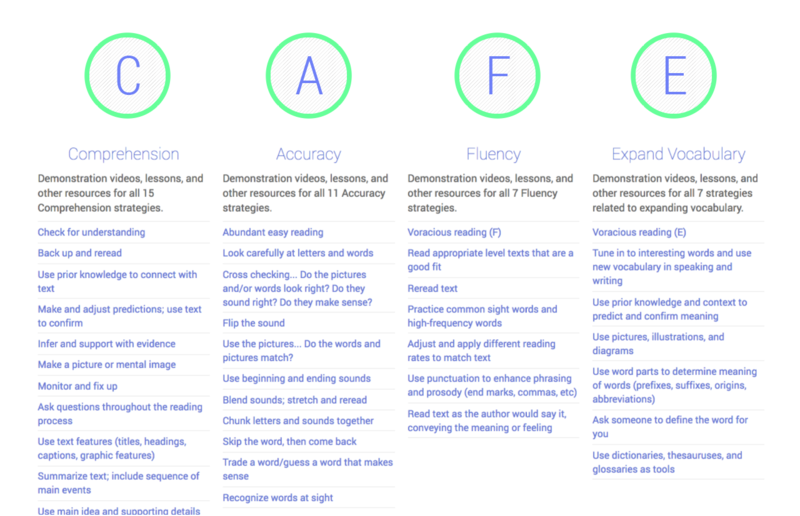 This organized and invaluable tool leads to articles, assessments, books, lessons, Parent Pipelines, and Ready Reference Guides for each skill and strategy. CAFE is the literacy system that compliments the Daily 5 structure. Posted on the classroom wall and built throughout the year, the CAFE Menu serves as a visual reminder of whole-class instruction as well as individual student goals. 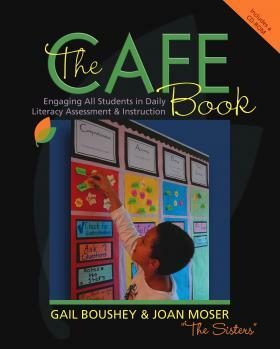 By focusing on the four key components of successful reading: Comprehension, Accuracy, Fluency, and Expanding Vocabulary, and providing strategies to support each goal, the CAFE System is an efficient and effective way to assess, instruct, and monitor student progress.